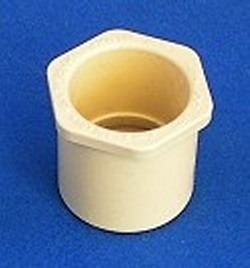 Reducer Bushing 1.25" sch 40 to 1.25" CPVC CTS (Copper Tube Size, the almond colored plastic pvc pipe). This is the bushing you would use if you want to use 1.25" CPVC CTS plastic pipe with any of our 3 ways 4 ways , 5 ways or 6 ways. Made in the U.S.A.